Look who I found in the corner of the window sill this morning. A friendly little sprite clinging to some dried flowers. 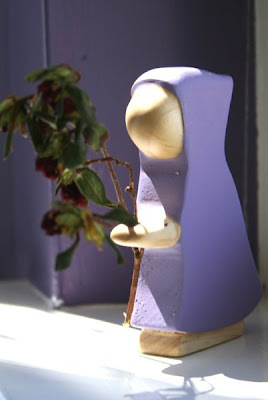 This sprite, from Syrendell, made her way into Elizabeth's room shortly before Easter, and has traveled the house since then carrying many things. She looks particularly lovely here offering her dried flowers to the nature table. Yesterday, a quick trip to our local used bookstore, where I usually have great luck finding chapter books, but not as much luck finding good picture books, yielded a litany of wonderful books. The Vanishing Pumpkin, illustrated by Tomie DePaola; 1 is One, by Tasha Tudor; and When the Root Children Wake Up, illustrated by Ned Bittenger, to name a few. A funky little 80s-looking board book called The Forest Friends, full of gnomes and woodland animals, was decidedly Finn's favorite. 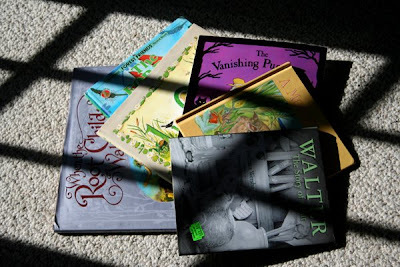 Elizabeth flew through the whole lot of books, except Walter: The Story of a Rat, a chapter book about a literary rat, and declared When the Root Children Wake Up to be her favorite. You just never know what the day might hold, or what treasures you might find inside the used bookstore. You found some real treasures at the bookstore! And that little sprite is so sweet. you are so lucky to have such an amazing used book store near you. 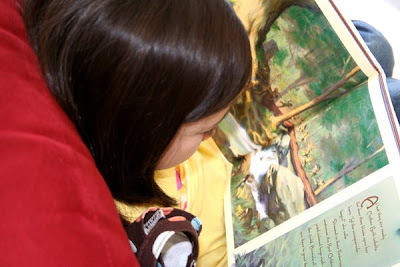 i love used book stores and could spend hours and hours browsing and luckily my children love spending time there too. we have the tasha tudor book 1 is one and love it. The little sprite is so sweet! You got some great used books too.